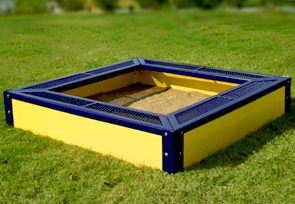 Kids will enjoy endless hours of summer playtime with this high-quality commercial grade sandbox. Featuring four built-in bench seats which provide convenient seating on the inside. Keep children occupied while giving them a place for learning and creativity. Thermoplastic coated for extremely durable, long-lasting weather resistant properties. Finished in a slightly lightly textured polyethylene coating. Customize with vibrant color choices below to create a fun inviting environment kids will love. 11" x 73-1/2" Seat Dimensions.